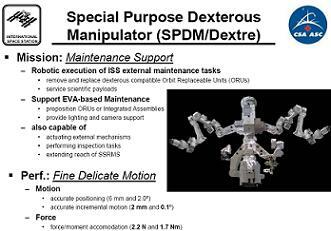 Canada’s Special Purpose Dextrous Manipulator (SPDM), also known as “Dextre” or the “Canada Hand”, is, for the first time since its launch in March 2008, being used for operational purposes aboard the International Space Station (ISS) this week. The operations are in support of Japan’s H-II Transfer Vehicle-2 (HTV-2) mission. 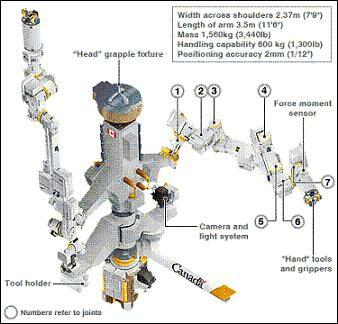 The SPDM is part of Canada’s Mobile Servicing System (MSS), which also includes the Space Station Remote Manipulator System (SSRMS), Mobile Base System (MBS), and Mobile Transporter (MT). It was launched to the ISS as a “flat-pack” kit aboard STS-123 in March 2008. Upon its arrival at the ISS, Extravehicular Activity (EVA) crewmembers assembled the SPDM’s individual parts, which rode up to space on a modified Spacelab Pallet (SLP). The primary purpose of the SPDM is to perform dextrous tasks that require fine, minute control. 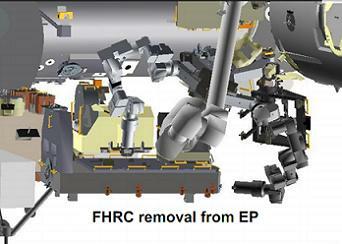 In the past, such tasks have been performed by EVA crewmembers, as the Shuttle and Station RMS’s are unable to provide fine control due to their large Latching End Effectors (LEEs), which are used to grapple payloads. Being able to perform these tasks with the SPDM removes the risk to EVA crewmembers, and enables the ISS crew to concentrate on science while ground controllers operate the SPDM. The SPDM’s construction consists of a LEE, which the SPDM uses to attach itself to grapple fixtures, and a Power & Data Grapple Fixture (PDGF), which the SSRMS uses to grapple the SPDM. The Enhanced ORU Temporary Platform (EOTP), which was installed on the SPDM during STS-132 in May 2010, is used to hold ORUs in place on the SPDM. Four tool holsters and a video camera are also present. The SPDM’s manipulation control is provided by two seven-jointed arms, which are both terminated with ORU/Tool Changeout Mechanisms (OTCMs). The OTCMs are what provide the SPDM with its fine dextrous control. 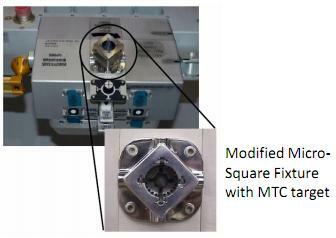 The OTCMs attach to specially designed micro fixtures on the Orbital Replacement Units (ORUs). The OTCMs feature a retractable motorised socket wrench used to torque bolts, a retractable umbilical connector used to provide electrical, data and video connections to payloads, and a camera and lights used for close-up viewing and to align the OTCMs with the micro fixtures. The OTCMs also feature Force/Moment Sensor (FMS) and Force/Moment Accommodation (FMA) systems. The FMS and FMA provide the OTCMs with a “sense of touch”, which allows the SPDM to apply precise amounts of force in exactly the right place and direction. The FMS monitors the forces, which are applied and corrected using the FMA. 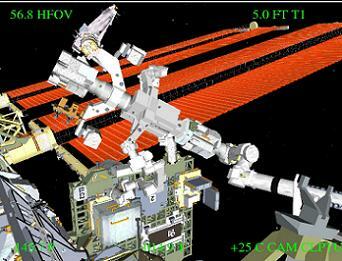 Following its delivery to the ISS in March 2008, the SPDM, never before tested in space, has been put through a rigorous set of checkout procedures, which culminated in an operational demonstration in late December 2010. On 22nd December, the SPDM removed Cargo Transportation Container-3 (CTC-3) from ExPrESS Logistics Carrier-2 (ELC-2) Flight Releasable Attachment Mechanism-1 (FRAM-1), and installed it on the EOTP. On the 23rd, the SPDM removed CTC-3 from the EOTP, and installed it onto ELC-2 FRAM-2. The results of the December 2010 were detailed in a “lessons learned” document, available to download on L2. The document provided a more detailed summary of the demonstration operations. CTC-3 uses the FRAM interface to attach to ELC-2. 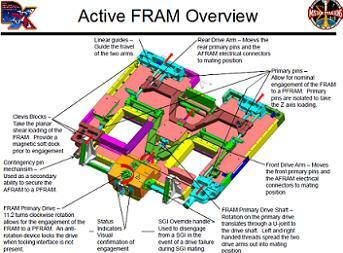 The Active FRAM (AFRAM) is on CTC-3, with the Passive FRAM (PFRAM) being on ELC-2. 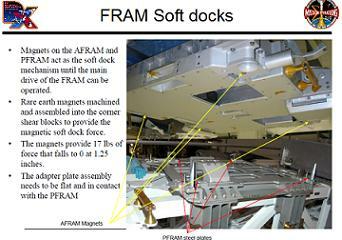 FRAMs feature a magnetic soft dock system. Four protruding magnets in each corner of the PFRAM fit into four magnetic slots in each corner of the AFRAM. The magnets provide 17 pounds of force (lbf) to draw the two sides together. The force falls to zero when the two sides come within 1.25 inches of each other. Once the soft docks are engaged, the two sides are bolted together. Electrical and data connections are automatically made upon bolt engagement. For the CTC-3 extraction from ELC-2 FRAM-1, the OTCM first released the FRAM bolt with nominal torque settings. The SSRMS then backed away, taking the SPDM & CTC-3 with it. The removal went smoothly, with the FRAM soft dock reading only ~6 lbf through the FMA. During the CTC-3 installation onto the EOTP, there were no issues with alignment techniques over the coarse alignment guides. However, the CTC-3 insertion manoeuvre with the FMA was terminated after 102 seconds due to an FMA timeout. Real-time monitoring of FMA data showed that Y and Z forces were low and stable, at less than 10 Newtons. The roll was low and the pitch appeared to be stabilising. The yaw was 30 N, so the FMA was likely still working on this axis. Yaw and pitch corrections were required due to termination of the insertion manoeuvre prior to the FMA completing load alleviation. On the second day of operations, the OTCM released the FRAM bolt/connector with nominal torque. CTC-3 was successfully extracted from the EOTP with the FMA reading only ~6 lbf. For the CTC-3 installation onto ELC-2 FRAM-2, the installation manoeuvre was attempted without the use of the FMA. The manoeuvre from -14 cm was stalled at -6 cm with an induced pitch error of ~2.5 degrees. The pitch was corrected, CTC-3 was pushed back into ELC-2, but was stalled at -5 cm with an induced Z error of ~1 cm. The Z error was corrected, CTC-3 was pushed back in, but stalled with no X motion and an induced Z error of ~2 cm. Due to time constraints, the decision was taken to install using the FMA. With the FMA enabled, the manoeuvre from 5 cm was allowed to run for 93 seconds. All forces were low and stabilised, and the installation was a success. As the FRAM bolt drives structural pins and a power umbilical, an inhibit is required so that a “hot” connector is not mated. It was discovered that powering off the body for the power inhibit caused the loss of FMS data input to the FMA. Correction manoeuvres were performed with the FMA active, but because all FMS data was zero, the FMA was effectively inaccurate. The lessons learned were: “Allow install manoeuvre to run longer giving FMA opportunity to correct misalignments”, “Perform FRAM attachment to EOTP as two stage operation with Body powerdown prior to connector mate to prevent FMA data interruption”, “FRAM install without FMA is best effort and can require significant additional time to accomplish”, and “Consider using FMA Mate payload file with generic manoeuvre timer values for non-FMA install”. Following on from the successful demonstration in December, ISS Managers gained confidence in the SPDM’s ability to perform its first ever operational tasks in support of the HTV-2 mission this week. A major overview of HTV-2 robotics operations were detailed in an expansive set of presentations acquired by L2. The operations kicked off on Tuesday 1st February, when the SSRMS grappled and extracted the Exposed Pallet (EP) from HTV-2’s Unpressurised Logistics Carrier (ULC). The SSRMS then manoeuvred the EP over to the Japanese Experiment Module Remote Manipulator System (JEM RMS), which grappled the EP. The SSRMS then released the EP, and the JEM RMS installed the EP onto the Japanese Exposed Facility. Attached to the EP are two new ORUs for the station – the Flex Hose Rotary Coupler (FHRC), which facilitates the transfer of ammonia coolant across the station’s Thermal Radiator Rotary Joint (TRRJ), and the CTC-4, which contains smaller items including Remote Power Control Modules (RPCMs) and a Video Distribution Unit (VDU). These two ORUs are attached to the EP via the FRAM interface. The FHRC and CTC-4 are destined to be installed on ELC-4 FRAM-5 and FRAM-1 respectively. However, ELC-4 currently resides in the Payload Bay (PLB) of Space Shuttle Discovery on LC-39A at KSC, awaiting delivery on the STS-133/ULF-5 mission in February. Under original plans, ELC-4 would have arrived at the ISS in December, prior to the FHRC and CTC-4 arrival. Due to the delays of the ULF-5 mission, the two ORUs have arrived at the ISS before their install site. Due to this fact, a plan was devised to temporarily store the ORUs on the SPDM until Discovery arrives with ELC-4. The three-day ORU transfer operation began on Wednesday, when the SSRMS walked-off from the Node 2 PDGF to MBS PDGF-3. The MT with MBS attached then translated from Worksite-5 (WS-5) to WS-7. Upon arrival at WS-7, the SSRMS grappled the SPDM and removed it from MBS PDGF-2, and manoeuvred it into position near the EP. On Thursday, the second day of operations, the SPDM arm 1 grappled the FHRC’s micro fixture, and released the FRAM bolt. The SSRMS then backed away, pulling the SPDM and FHRC with it. SPDM arm 1 then manoeuvred the FHRC to EOTP side 1 and torqued the FRAM bolt to secure it in place. The SSRMS then manoeuvred the SPDM into position so that SPDM arm 2 could grapple and remove CTC-4 from the EP. Once arm 2 had a hold of CTC-4, arm 1 moved in to grapple CTC-4’s second micro fixture, whereupon the umbilical was mated to provide electrical power to CTC-4. CTC-4 will remain attached to arm 1’s OTCM until its installation onto ELC-4 post ULF-5. The reason for leaving CTC-4 on arm 1 instead of EOTP side 2 is because having it on the arm will better distribute the heater power draw from the two ORUs, by putting less electrical load on the EOTP. Friday’s third and final day of operations started a few hours late due to the snow at Mission Control Center-Houston (MCC-H). The MT translated from WS-7 to WS-5, the SSRMS installed the SPDM onto the Lab PDGF, and SPDM arm 2 then released its grasp of CTC-4. The SSRMS then walked off to the Node 2 PDGF in preparation for Monday’s operations. On Monday 7th February, the JEM RMS will grapple the EP, remove it from the JEF, and hand it off to the SSRMS. The SSRMS will then re-insert the EP into HTV-2′s ULC. On Friday 18th February, the SSRMS will again change its base to MBS PDGF-1, in order to grapple and relocate HTV-2 from Node 2 Nadir to Node 2 Zenith, in support of ULF-5. The MSS will then be configured for ULF-5. For this, the SSRMS will change its base once more to Node 2’s PDGF. The MT will also translate from WS-5 to WS-3. An SPDM body roll maneuverer will be performed, in order to allow for access by ULF-5 EVA crewmembers, who will install a CLPA lens cover and remove some Multi Layer Insulation (MLI) blankets from the SPDM. Following the installation of ELC-4 onto the ISS during the ULF-5 mission, and Discovery’s departure from the ISS, the SSRMS will retrieve the SPDM from the Lab PDGF, and the MT will translate to the Starboard side of the station’s Truss. The SPDM will then install the FHRC and CTC-4 onto ELC-4 using the same method as was used during the December demonstration. The SPDM has an interesting future ahead of it, with two demonstrations already approved by NASA. 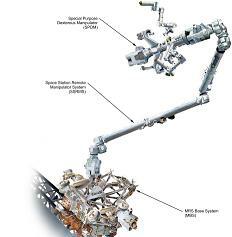 Following the official baselining of STS-135, NASA has confirmed that the Robotic Refuelling Dexterous Demonstration (R2D2) payload will ride up to the ISS on the LMC. R2D2 will demonstrate the feasibility and ability to refuel a satellite in space. For the test, the SPDM’s OTCMs will be equipped with tools that can cut through a satellite’s exterior, allowing a hose to be inserted into the satellite to pump fuel into its tanks. Tests will include locating, accessing and uncapping valves and transferring simulated liquid fuel. The tools and a demonstration satellite will both be launched on STS-135. In December 2010, NASA awarded Lockheed Martin Space Systems Company (LMSSC) a contract for Systems Engineering for In-Space Servicing (SEISS). SEISS will include two demonstration tasks, the first being R2D2, and the second being evaluation of a variety of tools, sensors and instruments to support autonomous rendezvous and capture capabilities for orbiting spacecraft systems. 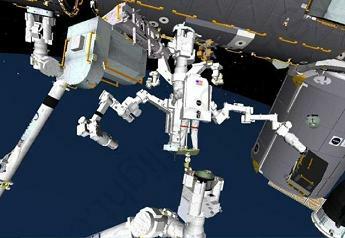 Robotics operations will play a large part in future human spaceflight missions, as current human operations are handed over to robots with increasing dextrous capability. The tests and operations performed by the SPDM will provide much needed data that will be used in the development of these future robotic systems. (Images used: Lead Image via NASA.gov. Images within the article via L2 Presentations).